The second recommended STT is located at Wong Tai Sin Chuk Yuen United Village which is divded into 10 pieces with nearly 9000 sq.feet. The site contains considerable historical and cultural significance and may has the potential to be used in different creative community experiments. 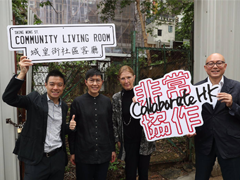 Following the “Shing Wong Street Community Living Room”, CollaborateHK is proud to present to you our second pilot project - the “Green Cadogan” Community Edu-tainment Space! The “Green Cadogan” scheme aspires to re-activate 14 ex-market booths in Cadogan Street Garden, Kennedy Town. Standing for over 70 years, these booths have humbly witnessed the vigorous wholesale market operations of the 1950s, their relocation in 1991, and the creation of a Temporary Cadogan Garden in 2000s. More recently, as a result of the community’s triumph over Town Planning Board’s decision to rezone this temporary open space for residential development, the government has finally approved to keep the greenery and ex-market booths for good. Surviving demolition but suffering a fate of deterioration, these 14 booths are in a sorry state due to minimal maintenance. Currently, 7 of which are being used for government storage, while the others are in desperate need for better usage. In light of the Government’s recent initiatives to strengthen waste reduction policies, rising local environmental awareness, and a common interest in conserving a piece of Hong Kong’s history, could the Cadogan booths seize their chance to serve the community again? As some locals proposed, could these booths function as a green community hub offering spaces for all to socialize, have fun and bring sustainable living into play? Over the coming months, CollaborateHK will organize a range of public engagement programmes in collaboration with Wisdom Regeneration and other local partners. We'd love to learn your insights towards the initiative. Stay tuned for further announcements, let’s us all work to rejuvenate this fantastic space together! With 2019 upon us, we’ll be featuring a selection of unique STT sites that could potentially be transformed into a fun, loving place for all every Thursday. Let’s uncover hidden gems and their potential uses across the city together! We first featured a 2700 sq. feet STT in Sheung Wan - offering an excellent location with terrific connectivity, which maybe great for passive recreation. 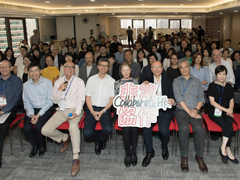 Since the beginning of our journey in promoting bottom-up community initiatives, CollaborateHK has been blessed with overwhelming support across government departments, professional institutes and the civil society. Recently, we are grateful that the government has increased funding and support towards NGO’s STT applications. 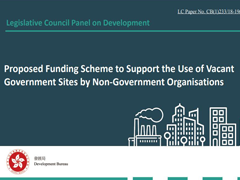 In late January, the Legislative Council’s Finance Committee has approved the Development Bureau’s funding scheme, which reserves $1 billion to sponsor NGOs taking up vacant government land. As such, each eligible STT project may apply for a maximum of $60 million to cover basic site restoration works, professional consultancy services and insurance. A simpler and transparent system for funding approval has been called for; professional institutes were also encouraged to share their expertise with NGOs in need. At the same time, Lands Department has also announced clearer STT application guidelines. In light of heated debates over land shortages and allocations in Hong Kong, it is time for the government and civil society to think out of the box. 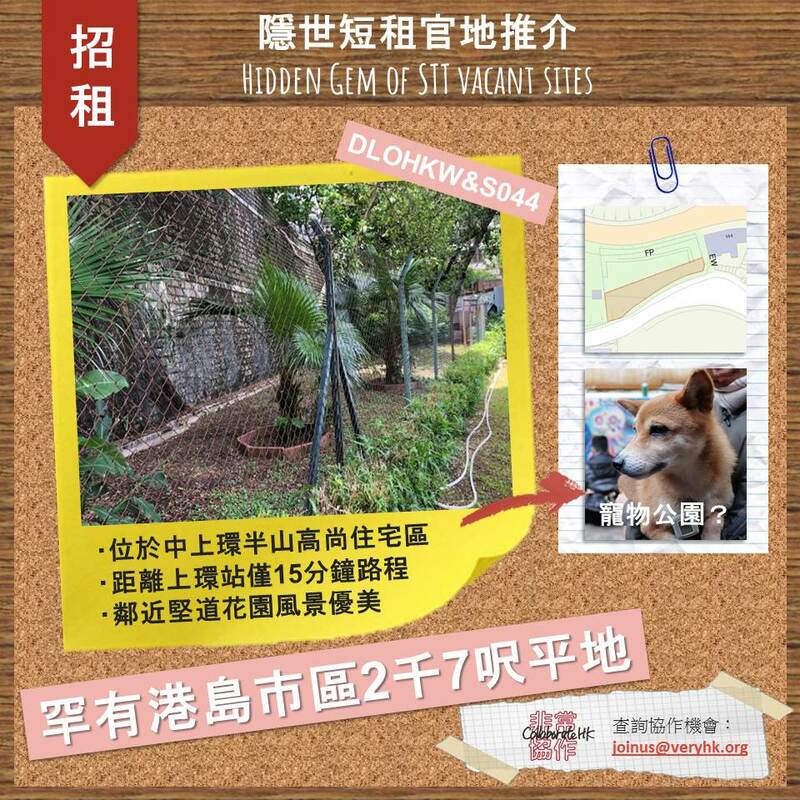 Constrained by their size, shape and accessibility, most vacant land listed on Lands Department’s Short Term Tenancy (STT) for community uses are unsuitable for housing nor long term development. However, we believe these sites could bring magnificent social impacts when all sectors join hands to reimagine community spaces that reflects public aspirations. Starting this semester, CollaborateHK is checking-in at the CUHK campus to share our vision and community-backed placemaking initiatives. 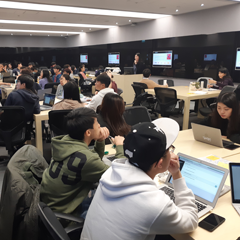 Special thanks must be given to Professor Mee Kam NG, Program Director of Urban Studies Program at the Chinese University of Hong Kong, who has kindly offered us an opportunity to network with 50 keen, deligent future urban leaders in class. Through a series of interactive lectures and field work, students will investigate STTs in different districts, identify local needs and concerns with stakeholders, and develop a placemaking proposal that meets community aspirations. We look forward to learning their creative schemes at the final presentation! Have you ever imagined what magic can wall-paintings do? As simple as beautifying the vacant back alley, an inclusive, participatory colour-adding exercise could also stimulate social interactions and bond the neighbourhood! 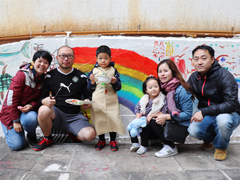 With lots of laughters, paints and music, our community wall-painting day was successfully held in mid-December! 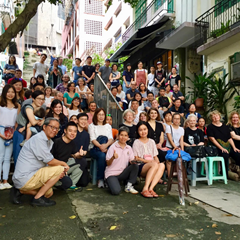 Co-organized in partnership with a local green group - Wisdom Regeneration, the event has attracted over 50 kai-fongs and art lovers to get creative in redecorating an underused community space in Sai Wan. Many mentioned that there is limited room for community-based art jamming nowadays, thus encouraged us to host more events of its kind in the future. More photos on Very Hong Kong facebook. 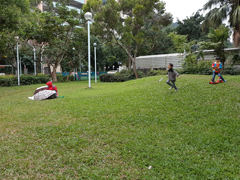 Sai Wan IG Pier, the newly opened Central and Western District Promenade, and the grassy Cadogan Street Garden... are these on the top of your head when we talk about public spaces in Kennedy Town? With the aim to understand public's perception towards current provision of community facilities in Kennedy Town, we are conducting a survey to learn your insights on the topic. Please spend 2-3 mins to complete the survey. 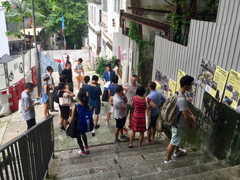 While we await the Lands Department’s official approval to fence-off the Shing Wong Street vacant site, VeryHK and Friends of the 30 Houses Neighbourhood will continue to engage and collaborate with local stakeholders. In late October, we presented the CollaborateHK report and our pilot scheme to the Central and Western District Councilors, social-welfare providers and local concern groups at the DC meeting. Thanks for all their support and advice! After several rounds of community engagement and insight collection, we have finally submitted the “Shing Wong Street Community Living Room” proposal to the Lands Department on October 18, 2018. A big thank you to everyone involved, especially the enthusiastic locals who haveoffered us invaluable support and feedbacks in order to take the project forward. Let’s keep our fingers crossed for the pending 3 year short-term tenancy approval, and we all look forward to opening up the fenced off space for community use soon! Official Launch of CollaborateHK Report! For decades, the stairs of Shing Wong Street have not only retained the unique character of the neighbourhood, but also offered valuable opportunities for users to interact and have fun. A day before the 30 Houses Yulan Festival, Very Hong Kong and local neighboursturned these historic steps into an outdoor theater! Two short films were shown, one documenting curious stories behind the PMQ revitalization, and the other about traditional local Yulan practices. The event ended with a walking tour along Staunton Street, where participants witnessed preparations of the Yulan ceremony. Stayed tuned for more upcoming community events, the next one could be just around the corner! 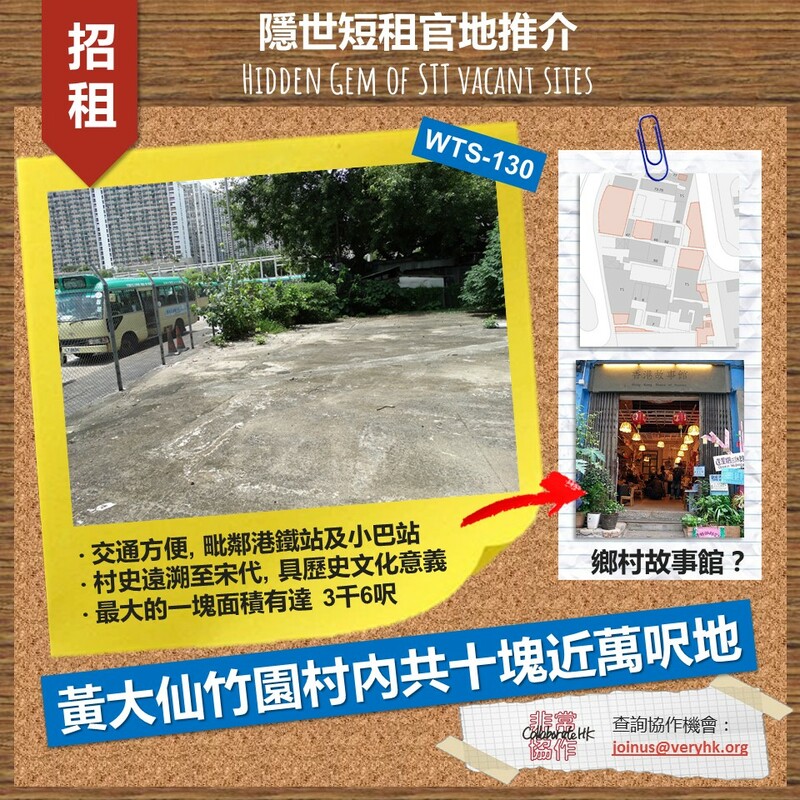 On Aug 19, taking a step forward from the CollaborateHK Sandbox, Shing Wong team seized their chance to engage the public in the “Community Living Room” scheme. Through panel displays, guided tours and interactive dialogues on-site, all participants were empowered to voice their thoughts on the proposal and future community development. A big thank you to all participants, kai-fongs, shopkeepers and our event co-organizer Central and Western Concern Group for all the support. In the coming weeks, we’ll incorporate these community aspirations into the pilot scheme. Let's collaborate to create beloved public spaces for all to enjoy! Following the Sandbox Charette, a Summit was held in May. The event attracted a wider audience: government officials, scholars, business and media representatives included. The 8 Sandbox teams were given the stage to present further developed design concepts with graphical illustrations. All presentations proved stellar upon the wonderful feedback received on the day. The event was wrapped up with a panel discussion on the topic: “ Community’s Role in shaping a Liveable City”. A special thanks and mention to all of our guest speakers for a fruitful and engaging conversation. In March, we hosted the first ever Sandbox event in town - the CollaborateHK Sandbox Charrette, for a round of community envisioning exercise. The 24 hour workshop brought together over 100 participants from all walks of life, including community leaders, scholars, professionals, and business representatives. Participants were split into 8 groups to propose a feasible and creative framework for a chosen site. In an advisory clinic, each team had the opportunity to meet with practicing professionals from various industries to discuss the viability of their proposals, before coming together once again to present their innovative ideas. A big thank you to all our participants and advisors for making the event a success! 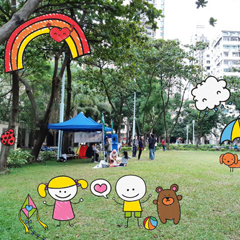 Are you ready to creatively redefine HK’s public spaces? VHK’s community-led event is back for a third run, and we want you to get involved! “Very Aberdeen” presented by Very Hong Kong will be coming to the Aberdeen Promenade on 15 May 2016 (Sunday). We’ve opened the call for event proposals, and everyone is welcome to submit your creative ideas on transforming the waterfront into something uniquely HK. It can be by art, culture, recreation, lifestyle, music – anything you can think of! Download the ‘Very Aberdeen 2016’ open call info pack here and don’t forget to send us your proposals by 31 March 2016! 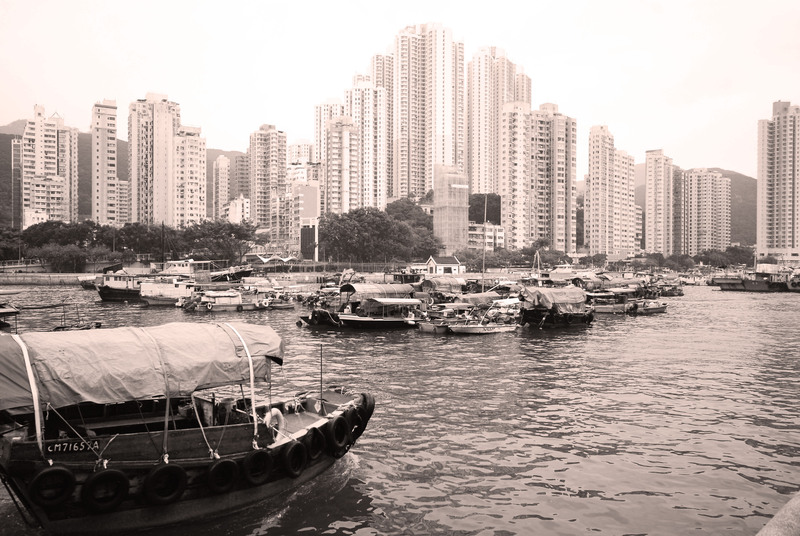 Experience Wanchai Ferry Pier as you’ve never experienced it before…. A week end packed with creative activities for everyone - from “Duckyland” creative LEGO workshop, urban sketches, live street music performances, an enormous ‘Under The Sea’ communal wall drawing, pop up short film screenings, experimental public art performance, Chinese ink painting and a host of creative workshops. There’s something for everyone so head down to Wanchai Ferry Pier to join in the fun! Are you ready to creatively redefine the City's public spaces in 2014? VHK will be hosting the next community led event at Wanchai Ferry Pier and we want YOU to get involved! 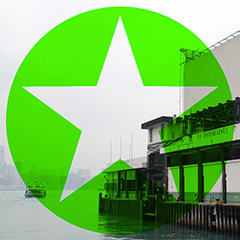 Download the Very Ferry Pier 2013 open call information pack. and e-mail us your proposal at joinus@veryhk.org. The submission deadline is 30th April. The construction of the VHK Bamboo Pavilion at Central New Harbourfront has finally started today! Very Hong Kong Supports Street Performers! Very Hong Kong Supports Street Performers. A special thanks goes out to The Flame who perform live every Saturday at Times Square. sdLast night saw the city's first independent, community-founded festival, Very Hong Kong, announce its much anticipated headline events during "A Very Hong Kong Sketch Night"; bringing together the public, creative industry bodies, partners and potential collaborators at The Space Gallery, Sheung Wan. Very Hong Kong, the city's first independent, annual program encouraging a mix of community-founded arts, culture, design and creative events cemented its position on Hong Kong's city calendar on 25th June - hosting a launch forum for industry bodies, potential partners and creative collaborators at the Duke of Windsor Building in Wan Chai.